One of the most traditional forms of classroom teaching is the lecture. This specific definition is important as it excludes contexts where a lecture is deliberately designed to be interrupted by questions or discussion between instructors and students. This form of more interactive lecturing will be discussed in the next section (Chapter 3, Section 4). Transmissive lectures can be traced back as far as ancient Greek and Roman times, and certainly from at least the start of the European university, in the 13th century. The term ‘lecture’ comes from the Latin, meaning a reading. In the 13th century, most books were extremely rare. They were painstakingly handcrafted and illustrated by monks, often from fragments or collections of earlier and exceedingly rare and valuable scrolls from ancient Greek or Roman times, or were translated from Arabic sources, since much documentation was destroyed in Europe during the Dark Ages following the fall of the Roman empire. As a result, a university would often have only one copy of a book, and it may have been the only copy available in the world. The library and its collection therefore became critical to the reputation of a university, and professors had to borrow the only text from the library and literally read from it to the students, who dutifully wrote down their own version of the lecture. Lectures themselves belong to an even longer oral tradition of learning, where knowledge is passed on by word of mouth from one generation to the next. In such contexts, accuracy and authority (or power in controlling access to knowledge) are critical for ‘accepted’ knowledge to be successfully transmitted. Thus accurate memory, repetition and a reference to authoritative sources become exceedingly important in terms of validating the information transmitted. The great sagas of the ancient Greeks and, much later, of the Vikings, are examples of the power of oral transmission of knowledge, continued even today through the myths and legends of many indigenous communities. 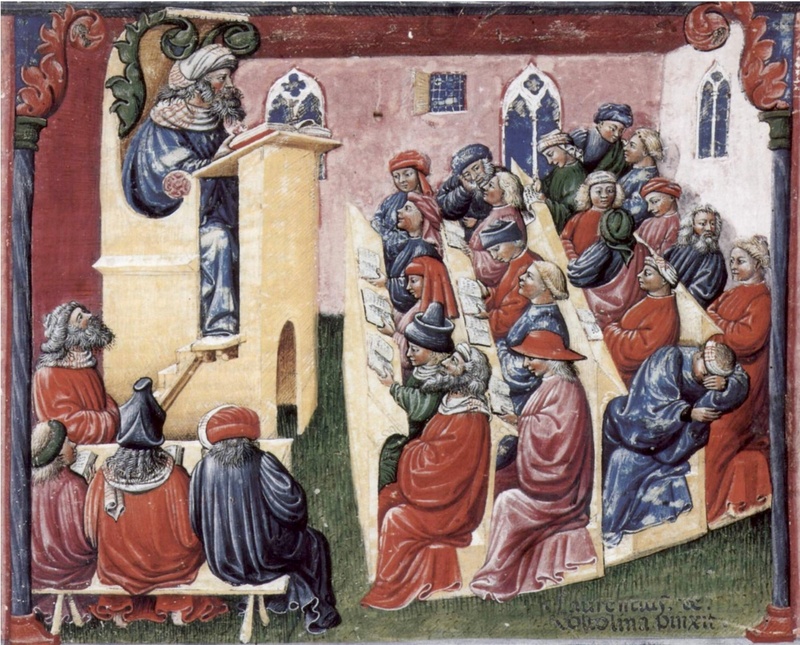 This illustration from a thirteenth-century manuscript shows Henry of Germany delivering a lecture to university students in Bologna, Italy, in 1233. What is striking is how similar the whole context is to lectures today, with students taking notes, some talking at the back, and one clearly asleep. Certainly, if Rip Van Winkle awoke in a modern lecture theatre after 800 years of sleeping, he would know exactly where he was and what was happening. What is remarkable is that even after the invention of the printing press, radio, television, and the Internet, the transmissive lecture, characterised by the authoritative instructor talking to a group of students, still remains the dominant methodology for teaching in many institutions, even in a digital age, where information is available at a click of a button. It could be argued that anything that has lasted this long must have something going for it. On the other hand, we need to question whether the transmissive lecture is still the most appropriate means of teaching, given all the changes that have taken place in recent years, and in particular given the kinds of knowledge and skills needed in a digital age. 3.3.3 What does research tell us about the effectiveness of lectures? lectures are relatively ineffective for teaching behavioural skills. These research studies have shown that in order to understand, analyze, apply, and commit information to long-term memory, the learner must actively engage with the material. In order for a lecture to be effective, it must include activities that compel the student to mentally manipulate the information. Many lecturers of course do this, by stopping and asking for comments or questions throughout the lecture – but many do not. Again, although these findings have been available for a long time, and You Tube videos now last approximately eight minutes and TED talks 20 minutes at a maximum, teaching in many educational institutions is still organized around a standard 50 minute lecture session or longer, with, if students are lucky, a few minutes at the end for questions or discussion. for all other important learning activities, such as developing critical thinking, deep understanding, and application of knowledge – the kind of skills needed in a digital age – lectures are ineffective. Other forms of teaching and learning – such as opportunities for discussion and student activities – are necessary. 3.3.4 Does new technology make lectures more relevant? Over the years, institutions have made massive investments in adding technologies to support lecturing. Powerpoint presentations, multiple projectors and screens, clickers for recording student responses, even ‘back-chat’ channels on Twitter, enabling students to comment on a lecture – or more often, the lecturer – in real time (surely the worse form of torture for a speaker), have all been tried. Students have been asked to bring tablets or lap-tops to class, and universities in particular have invested millions of dollars in state of the art lecture theatres. Nevertheless, all this is just lipstick on a pig. The essence of a lecture remains the transmission of information, all of which is now readily and, in most cases, freely available in other media and in more learner-friendly formats. I worked in a college where in one program all students had to bring laptops to class. At least in these classes, there were some activities to do related to the lecture that required the students to use the laptops during class time. However, in most classes this took less than 25 per cent of the lesson time. Most of the other time, students were talked at, and as a result used their laptops for other, mainly non-academic activities, especially playing online poker. Faculty often complain about students use of technology such as mobile phones or tablets, for ‘non-relevant’ multitasking in class, but this misses the point. If most students have mobile phones or laptops, why are they still having physically to come to a lecture hall? Why can’t they get a podcast or a video of the lecture? Second, if they are coming, why are the lecturers not requiring them to use their mobile phones, tablets, or laptops for study purposes, such as finding sources? Why not break the students into small groups and get them to do some online research then come back with group answers to share with the rest of the class? If lectures are to be offered, the aim should be to make the lecture engaging in its own right, so the students are not distracted by their online activity. 3.3.5 Is there then no role for lectures in a digital age? Lectures though still have their uses. One example is an inaugural lecture I attended for a newly appointed research professor. In this lecture, the professor summarised all the research he and his team had done, resulting in treatments for several cancers and other diseases. This was a public lecture, so he had to satisfy not only other leading researchers in the area, but also a lay public with often no science background. He did this by using excellent visuals and analogies. The lecture was followed by a small wine and cheese reception for the audience. lastly, he put a great deal of work into preparing this lecture and thinking about who would be in the audience – much more preparation than would have been the case if this was just one of many lectures in a course. students get no practice themselves in modelling this skill, even if they are aware of the modelling. Perhaps more importantly, looking at McKeachie and Svinicki’s suggestions, would it not be better for the students, rather than the lecturer, to be doing these activities in a digital age? So, yes, there are a few occasions when lectures work very well. But in a digital age they should not be the default model for regular teaching. There are much better ways to teach that will result in better learning over the length of a course or program. 3.3.6 Why are lectures still the main form of educational delivery? see the scenario at the start of this chapter. 3.3.7 Is there a future for lectures in a digital age? lastly, and most significantly, the priority for teaching will have changed from information transmission and organization to knowledge management, where students have the responsibility for finding, analyzing, evaluating, sharing and applying knowledge, under the direction of a skilled subject expert. Project-based learning, collaborative learning and situated or experiential learning will become much more widely prevalent. Also many instructors will prefer to use the time they would have spent on a series of lectures in providing more direct, individual and group learner support, thus bringing them into closer contact with learners. the wrap-up to a course. Lectures will provide a chance for instructors to make themselves known, to impart their interests and enthusiasm, and to motivate learners, but this will be just one, relatively small, but important component of a much broader learning experience for students. 1. Do you agree that lectures are dead – or soon will be? 2. Look at the skills needed in a digital age described in Chapter 1. Which of these skills could lectures help develop? Would they need to be redesigned or modified to do this and if so, how? Write down your answers in the comment section at the end of this chapter. 3.3 Transmissive lectures: learning by listening by Anthony William (Tony) Bates is licensed under a Creative Commons Attribution-NonCommercial 4.0 International License, except where otherwise noted.